An open source robot design from the Ecole Polytechnique Fédérale de Lausanne, EPFL. 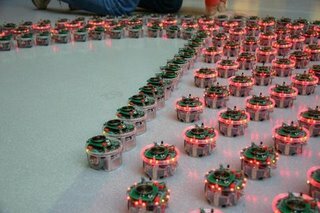 It is a collaborative effort from Autonomous Systems Lab, Swarm Intelligence Group and Laboratory of Intelligent Systems. Sounds dangerously like someone may be trying to devise a way to conquer the universe. 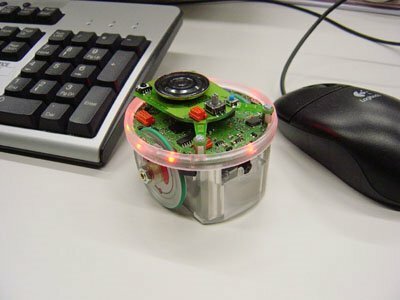 They claim that the robot was designed to be used in college level classes for microprocessor design. They call the classes "Microinformatique" - most likely translates to "small robots to take over the universe." Watch this video of 278 e-pucks. If you ask me, it looks like they're up to something. Several other I/O interface ports. Some upgrades that have already been designed are an omnidirectional camera, IR ground sensors and a multicolor LED display ring. Is there a similar base platform sold by anyone which would have encoders on wheels preinstalled? Encoders are not required as motors are step by step motors so the exact motor displacement is known.